Imprint Method: UNIMPRINTED - Carry your marketing campaign to the next level with the non-woven insulated shopper tote bag! 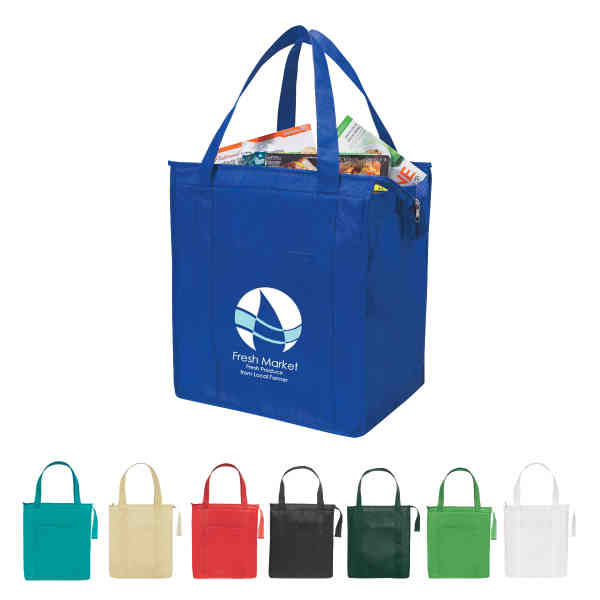 Made of 80 gram non-woven, coated water-resistant polypropylene, this tote features reinforced 23" handles, a 9" gusset, zippered closure, and a front pocket. Recyclable and reusable, the practical promotion keeps food hot or cold, making it great for grocery stores, tradeshows, markets, and much more. With a variety of colors available, an imprint of your logo or company name is sure to stand out. With this shopper tote, get your brand in your customers' hands! Size: 13 " x 15 " x 9 "
Imprint Size:4 1/2" x 6"